Custom Chocolate Construction gifts - perfect powertools. Build the best gift possible for the Construction worker in your organization or in your personal family. 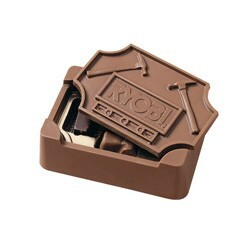 The Small Chocolate Tool Box is 10 oz of solid milk or dark chocolate with a tool design lid that can be personalized. The Small Chocolate Tools Box is filled with 2 chocolate saws along with 2 chocolate hammers. Gold keepsake tin with matching gold/black ribbon. The imprint are on the lid is 2 3/8" X 8/10". Size : 4 1/4" X 3"